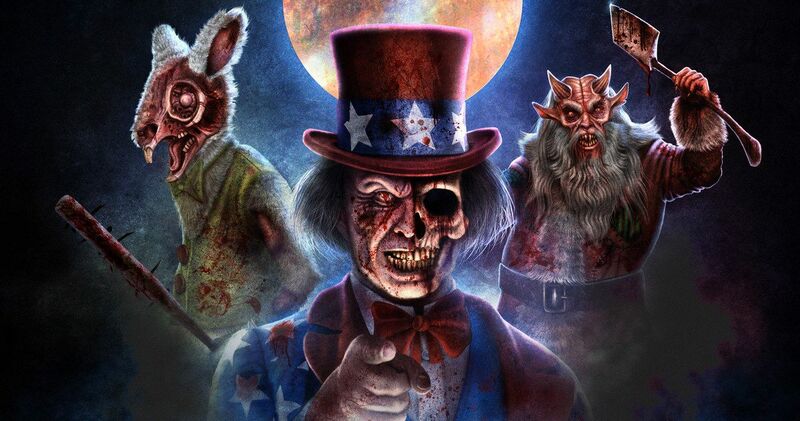 From New Year’s Eve to Valentine’s Day, from Easter to the Fourth of July and from Thanksgiving to Christmas, Universal Studios Hollywood adds a demented twist to life’s biggest moments in the all-original Halloween Horror Nights maze, Holidayz in Hell. Inspired by the popular scare zone of the same name, the Holidayz in Hell maze will feature an original score by Electronic Music Artist and Producer Figure and offer guests new reasons to dread the holidays. A tortured Tunnel of Love, inhabited by a crazed Cupid on a quest for hearts to break or take will make this Valentine’s Day anything but romantic; an unhinged Uncle Sam will create a sinister July 4th killerbration; treacherous turkeys will gobble, gobble an unsuspecting family; and a sick Santa will adorn Christmas Trees with human body parts, with many other milestone killer holidays. Those who survive the Holidayz in Hell need not let down their guard just yet as a creepy Christmas-themed scare zone with additional frights awaits to fill beating hearts with holiday fear. In addition to the music of Figure, who previously created a series of original sounds for Halloween Horror Nights, guests can expect to hear a new rendition of their favorite holiday tunes, remixed to accompany this hellish new maze. Halloween Horror Nights at Universal Studios Hollywood begins Friday, September 13, and brings together the sickest minds in horror to immerse guests in a living, breathing, three-dimensional world of terror. Featuring an all-new slate of unrivaled film production quality mazes and frightful scare zones uniquely themed to today’s most definitive horror properties, “Halloween Horror Nights” will taunt, terrorize and torment guests with spine-chilling haunted attractions as part of Southern California’s most extreme Halloween experience. Universal Studios Hollywood is The Entertainment Capital of L.A. and includes a full-day, movie-based theme park and Studio Tour. As a leading global entertainment destination, Universal Studios Hollywood delivers highly themed immersive lands that translate to real-life interpretations of iconic movie and television shows. Attractions include “The Wizarding World of Harry Potter™” which features a bustling Hogsmeade village and such critically-acclaimed rides as “Harry Potter and the Forbidden Journey” and “Flight of the Hippogriff™”, and the highly-anticipated Summer opening of “Jurassic World-The Ride.” Other immersive lands include “Despicable Me Minion Mayhem” and “Super Silly Fun Land” as well as “Springfield,” hometown of America’s favorite TV family, located adjacent to the award-winning “The Simpsons Ride™” and DreamWorks Theatre featuring “Kung Fu Panda Adventure.” The world-renowned Studio Tour is Universal Studios Hollywood’s signature attraction, inviting guests behind-the-scenes of the world’s biggest and busiest movie and television production studio where they can also experience such thrill rides as “Fast & Furious-Supercharged” and “King Kong 360 3D.” The adjacent Universal CityWalk entertainment, shopping and dining complex also includes the all-new multi-million dollar, redesigned Universal CityWalk Cinema, featuring deluxe recliner seating in screening room quality theaters, and the “5 Towers” state-of-the-art outdoor concert stage. Speed Bus Goes for $102K at Auction, Can It Still Hit 50MPH?